I hate to say it but I figured out that it kind of sounds like ponponpon to me. While there are definitely similarities, I don't think that's it. For one thing I haven't heard Ponponpon before, having made a diligent effort to avoid KPP, yet it still seems familiar. I'm not sure if it's just the piano making me think of it, but maybe Your Song by Elton John? That can't be real...can it? gonna take a stab at the dark and guess that that picture has three other bottles labelled "John", "Paul", and "George" cropped out. As far as I know Coca Cola offered personalized bottle tags in some countries so it wouldn't be difficult to get a Ringo one. I was originally going to say that, unlike Bort, I don't think Ringo is a common enough name to justify mass producing. But I think I've figured it out. Notice that the photo is of a glass bottle. 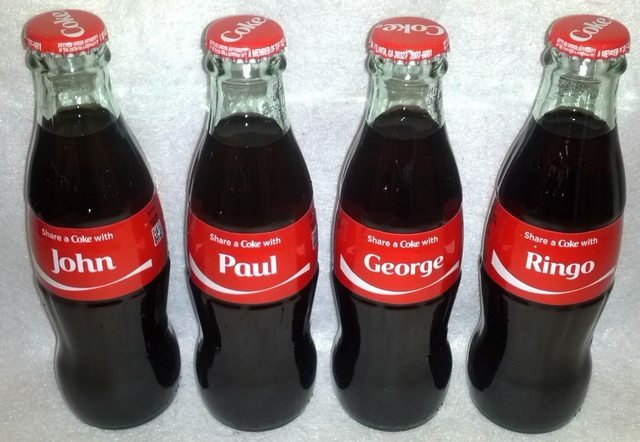 Apparently, you can order custom printed glass bottles direct from Coke, with any name you want. So theoretically one could order a bottle that actually said "Shiina Ringo" on it.